What’s about PAKSE-JAPAN SME SEZ? CHRISTY GEM CO., LTD. has acquired the investment license in Pakse -Japan SME SEZ. 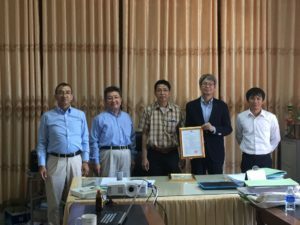 CHRISTY GEM CO., LTD. (Thailand subsidiary of Kuwayama Co., Ltd. (Tokyo- manufacture and sale of jewelry) decided to invest in Pakse- Japan SME SEZ. On May 15, 2018, Lao National Committee for Special Economic Zone Champasak Province is given the investment license and company registration to Christy Lao Co., Ltd. They are starting production at the PJSEZ Rental Factory. Copyright © PAKSE-JAPAN SME SEZ DEVELOPMENT CO., LTD. All rights reserved.